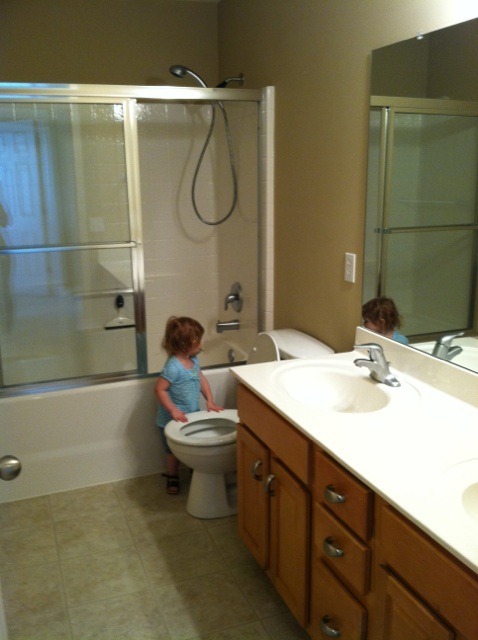 So the inspection on our new house took place on Thursday. We were pleasantly surprised to discover that the previous residents had moved out already and the place was totally empty. Yippee!! Funny how a small thing like that can be such a big deal. At first it wouldn’t see so momentous but it is. First of all, we no longer have to worry about inconveniencing them when we want to drop by or need to take measurements or whatever. AND most importantly, it now feels more like ours. With all the rooms empty, we can visualize what we will do with them and the possibilities are endless. 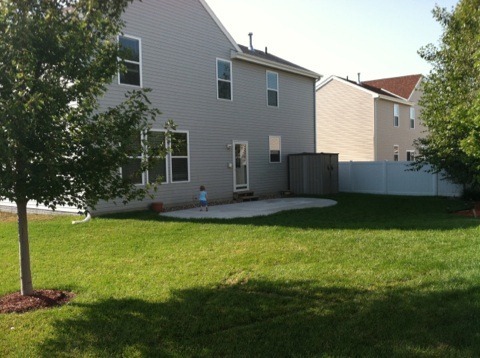 I took some pics of the house while we were there so you can see what we have to work with. Part of me was scared that it wouldn’t be as nice as I remembered or that we’d find something awful. But no such thing happened. In fact, it was even better than we had remembered! I was trying to get a pic of the house with the SOLD sign but was parked in the middle of the street and had to hurry. You can kind of sort of see it there, front and center, from the side. Still pretty as a picture though! 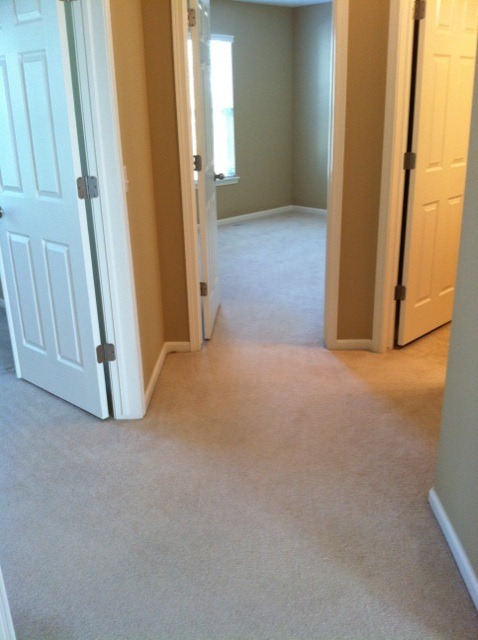 Here’s what you see when you first walk in (well try to picture it without the step ladder…). 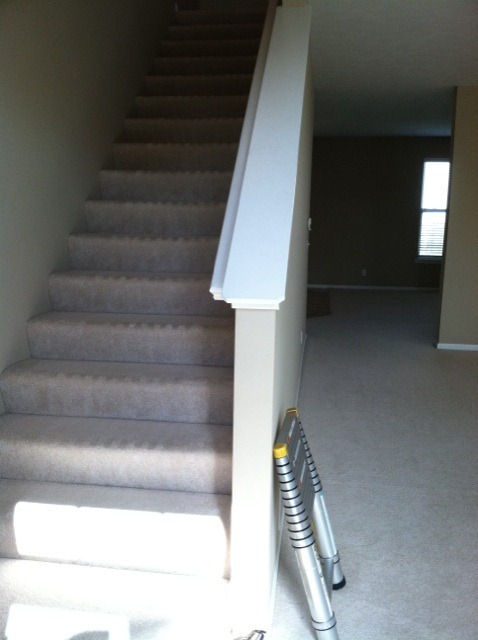 Stairs on your left (along with a coat closet), kitchen straight ahead, living room and dining room to the right. 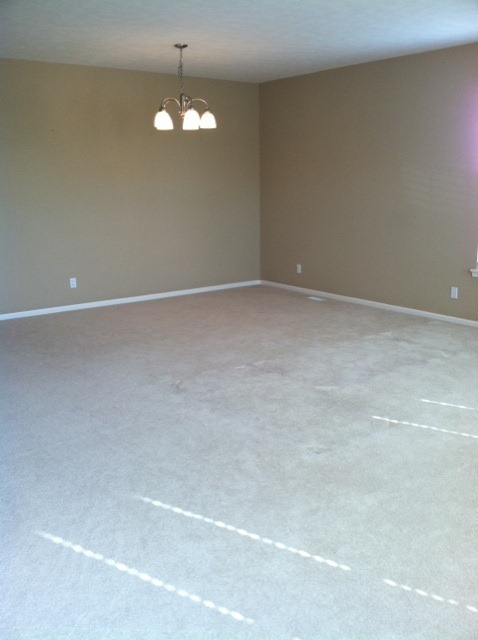 OK so it just looks like a big empty room. But the back part is the dining room (under the light) and the front part is the living room (which really starts on the far right of this picture, where the baseboards run out of the frame). If you walk straight in from the front door, and keep going, you’ll walk right in to the kitchen. Unfortunately I didn’t get a pic because the inspector had his stuff all over it and I forgot to take one when we left. But it still looks a lot like this, only without the table. I had forgotten how many cabinets there are. Easily double what we have now. I don’t know where to begin to put all my stuff away. And the counter space! Mama mia! New details I noticed: there is a Lazy Susan cabinet in the corner (love! ), the sink is deeper than average and NOT stainless steel (which is what we have now – they look pretty but are sure hard to keep clean), the countertops are a solid surface Corian, (which meant nothing to me. Apparently it’s meant to mimic the look of granite but is better because granite and some of the others stain really easily), and they left us a cutting board that matches the counter tops. Win! That white door on the left goes to the basement. More to come on that later. 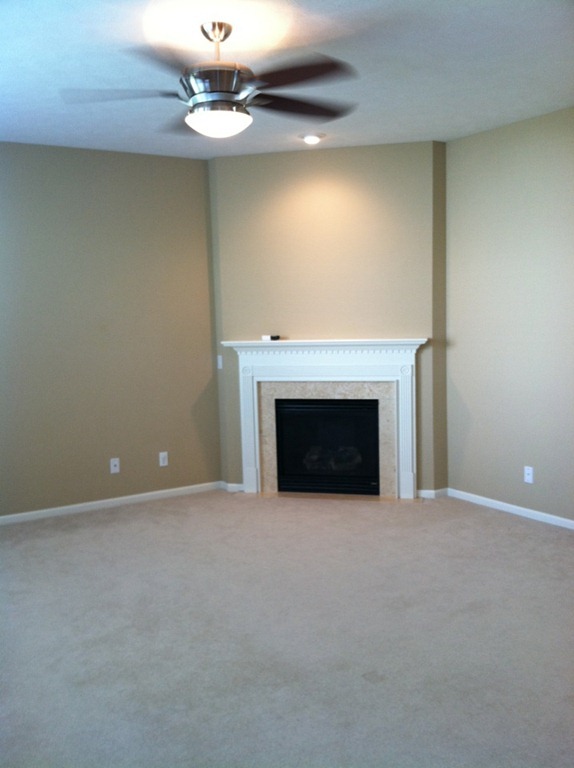 Just off the kitchen (to the left of where that photo ends) is the family room. The fireplace is gas and that little white/black thing you sitting on the mantle is a remote control for it (the white part is a note they left themselves saying DO NOT PACK)! Who knew! I guess we can be sitting on the couch and just push a button to have a fire. Hells yeah! The ceiling fan is also remote controlled which is so nice. I HATE having to reach up on my tip toes to pull the stupid chains in our house now (and I always pull the wrong one and end up putting the fan speed on turbo when I really meant to turn on the light!). 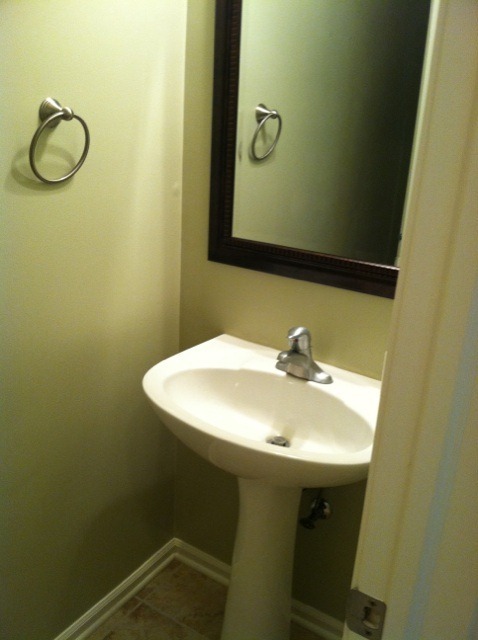 By the way, the wall colors and trim are what I always wanted in our house but we never got around to doing. In fact, we (er, CJ) were going to paint it like that the week before it sold and ended up not having to! Another sign that it was meant to be! 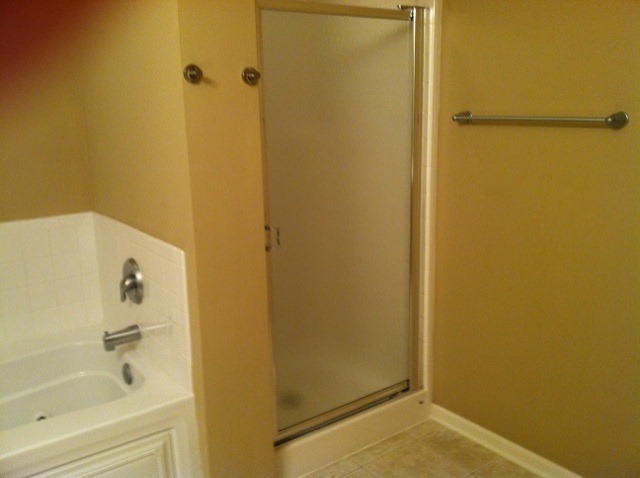 On the other side of the kitchen is the door to the garage, a half bath and the laundry room. 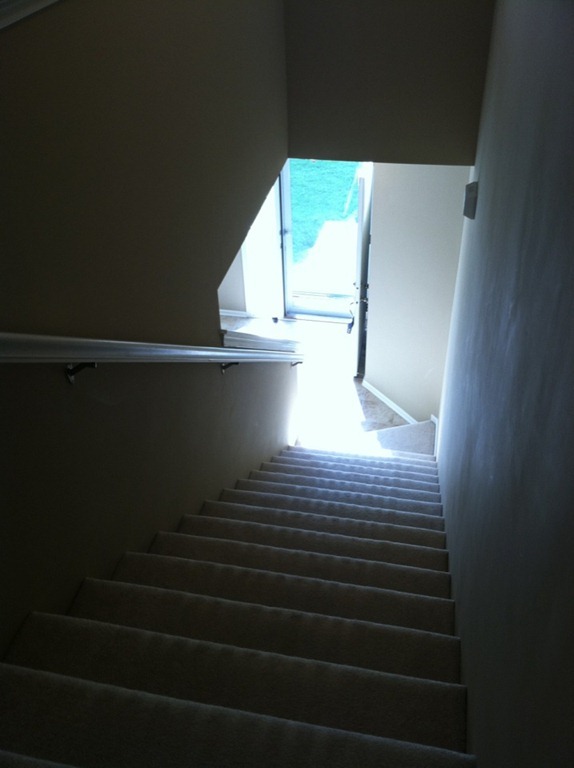 Then we venture upstairs. Isabella had fun playing on the stairs, though she’s starting to learn that she can fall down them (since she’s done it 3 times). 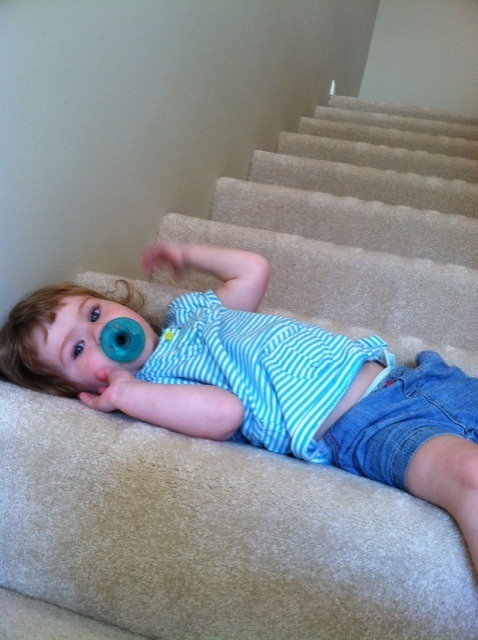 No, she’s not in the process of rolling down. She was pretending to nap and asking me for a blanket. I didn’t have one so I laid on top of her and said I’d be her blanket. I was told that was wrong. The master bedroom is on the left (double doors), another bedroom straight ahead (though that will probably be our guest room/office), and the kids’ bathroom to the right. Looking down the hall to the right are the other 2 bedrooms and the “loft” at the end. 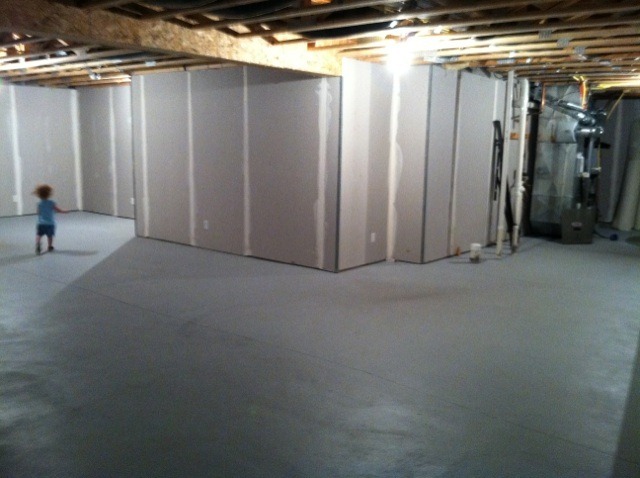 I discovered all the rooms have cable outlets in them, even the loft – sweet! Isabella has claimed this room. 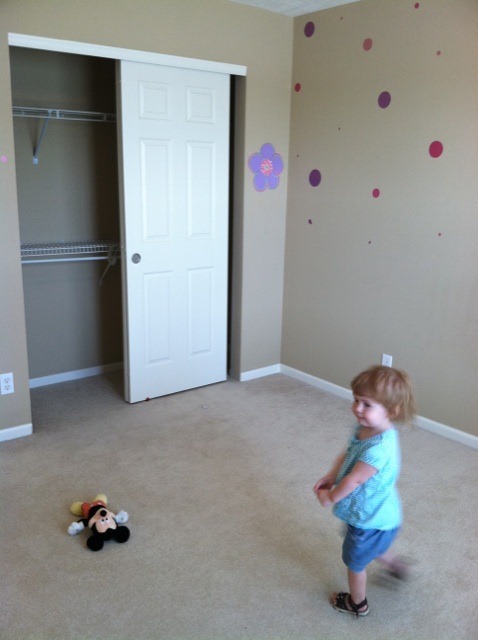 I think she likes it because of the pink/purple dots on the wall and the flower. I tried to peel one off and some paint started to come with it. Not sure if we’ll leave them or what but she seems to like it! 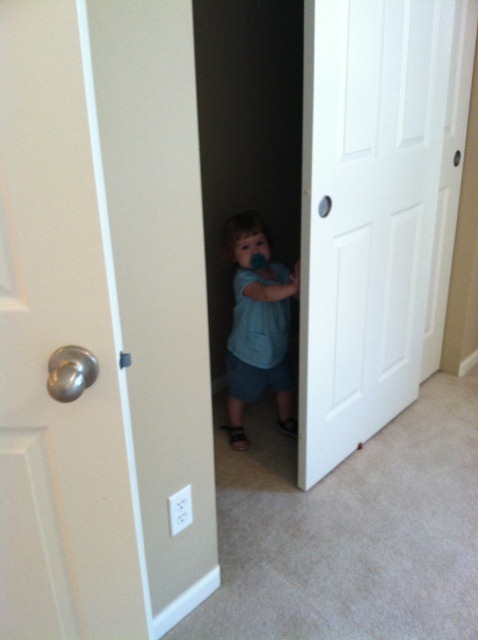 She had fun hiding in the closet too. Peek-a-boo! 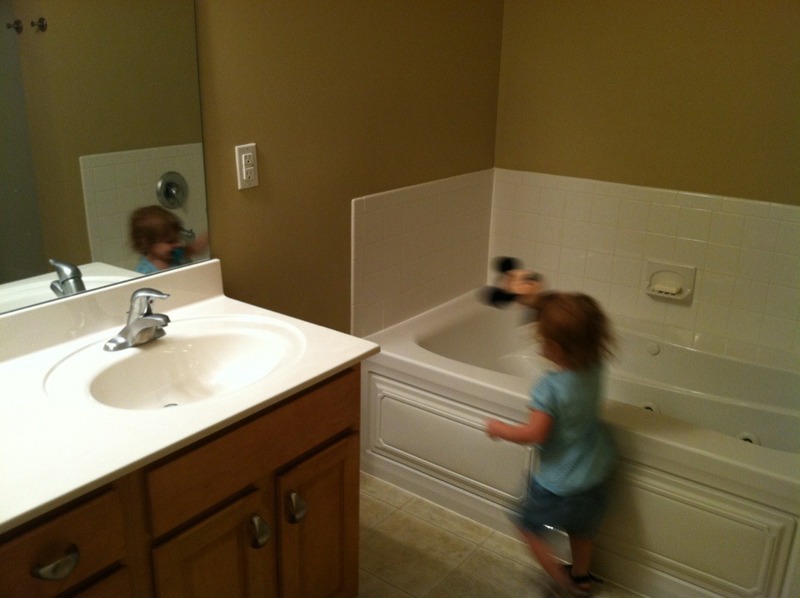 The main bath has double sinks which will be great for when we have more than one kid. 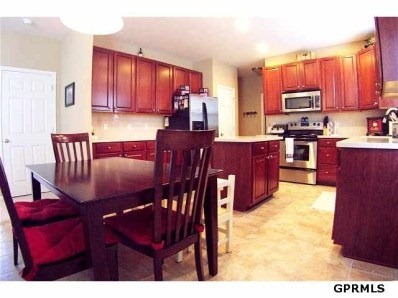 They won’t have to fight over sink/counter space. Yes I know she is touching the toilet seat. 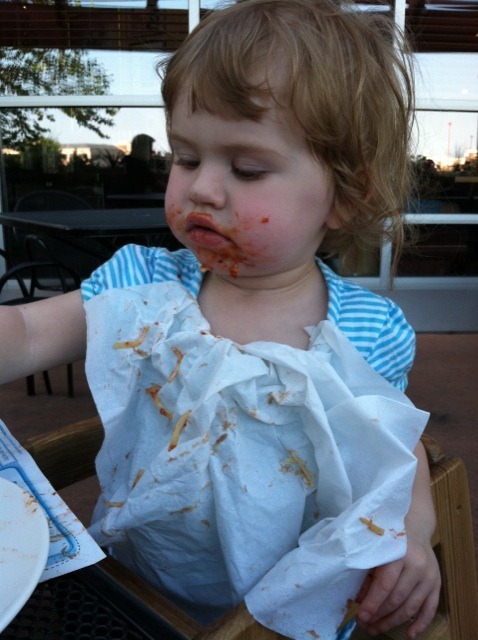 Don’t worry – I hosed her down with lye soap when we left. then the shower and then the toilet, which I didn’t take a pic of. I think you all know what those look like. It’s not like this one is gold plated or anything. 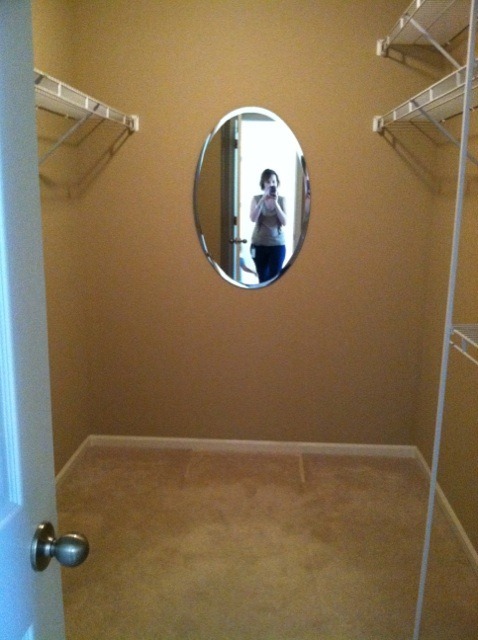 And our walk in closet. It’s bigger than it looks in the pic, though not as big as one that we saw in another house. That one was literally as big as Isabella’s room. I die. But, that house didn’t have the other features we wanted so I gave up that closet for a house that has everything else. 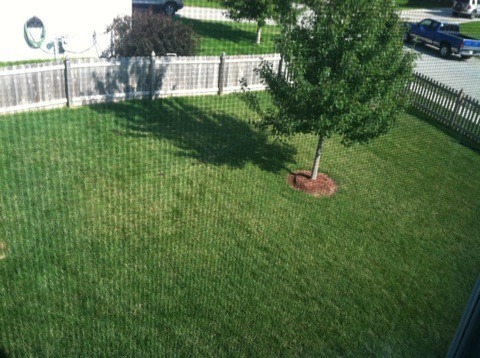 View of the backyard from the upstairs rooms. 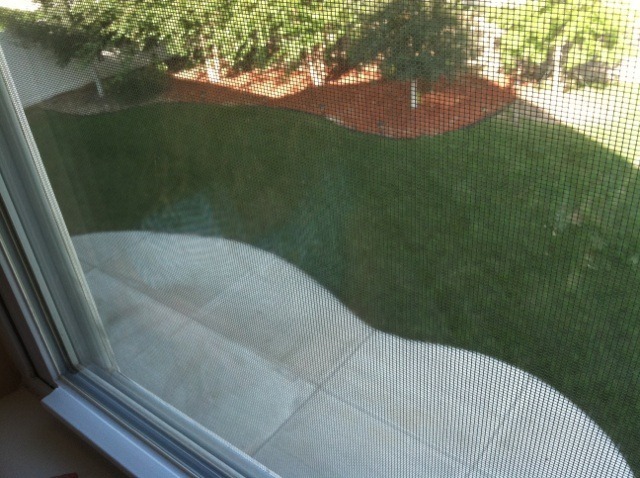 I like that the patio is curvy like that. Gives it some added interest. 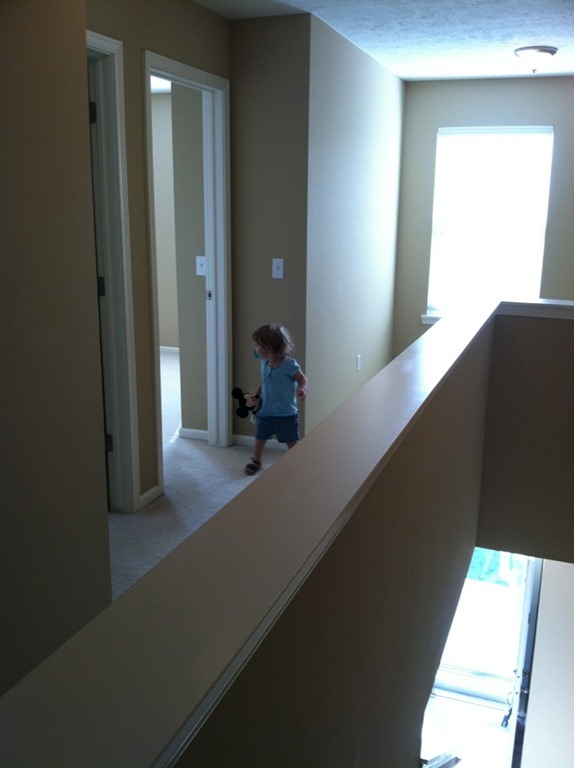 Here’s the view from the top of the stairs, looking down to the front door. I like the the steps have that one at the bottom that curves a bit. Gives it a spiral staircase feel and adds just that much interest to it. Now we shall head to the basement. Oooh…..aaaahh…Yeah ok so it’s not that exciting. But it is big and full of potential! Plus Isabella loved running around in it! 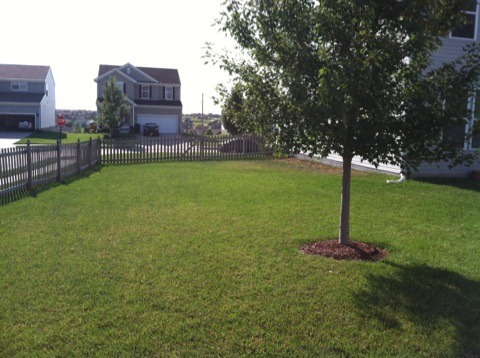 The back of the house and North side of our backyard. There you have it! 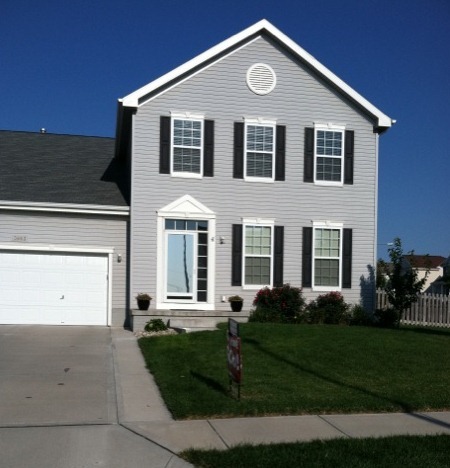 Our new house, ripe and ready for us to move in! Oh, by the way, the inspector only found one thing that needs to be fixed so we’re good to go after that! Everything seems to be falling in to place. We are scared that the other shoe is going to drop one of these days – can it really be this easy? But then we remind ourselves it wasn’t easy. We had to search and search for this house. she’ll love riding her trike around that basement in the winter! Can’t wait til you move in!